Backed with an industry experience of 14 years, we are in position to successfully garner to the diverse need of our clients by offering an alluring range of Knitted & Woven Garments. Further, we also offer a wide range of yarn and cotton textile material. 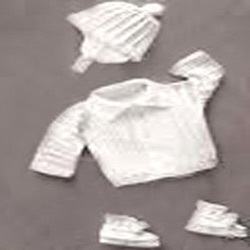 Our comprehensive range comprises Knitted and Woven Garments, Children Clothing and Infant Wear,Cotton T-shirt, Knitted Jogging Sets, Half Sleeves Knitted T-shirts, Denim Kids Wear, Children Rompers, Kids Wear with Prints & Embroidery and Cotton Romper Sets. In addition to this, we also offer Spun & Open End Yarns, Dyed Cotton Yarn, West African Raw Cotton, MCU-5 Raw Cotton and Shanker-6 Raw Cotton. Our wide range of assortment caters to different needs of textile, fabric exporters, garmants manufacturers and other retails outlets. Our organization is well known for our varied range of the Knitted & Woven Garments that is fabricated by using supreme quality of fabric which is sourced from one of the trusted vendors of the industry spread across the globe. Our exclusive designs, colors, and patterns make our garments unique from others available in the market. Apart from this, our whole array is fabricated as per the international quality standards ensuring complete client satisfaction. Due to a wide business network, we have attain our huge client base across the world. Some of the countries where we export are Hong Kong, Korea, Bangladesh and Dubai, United Kingdom, Sri Lanka and Egypt.